An avid Port Elizabeth surfer, Josh Enslin will put his mental and physical prowess to the test when he attempts to break the Guinness World Record for the longest surfing marathon on 14 and 15 November 2015. The 30-year old surfer will attempt a surfing session lasting more than 30 hours, to smash the current record of 29 hours and 27 minutes that was set by American surfer Ben Shaw in August last year. The motivating factor behind Enslin’s record attempt is not just for personal glory, but to raise funds, clothes, food and other non-perishable items for street children and children at children’s homes. He will also be collecting old surf equipment and old wetsuits that will be donated to underprivileged surfers by the Cyoh Surf Club. Putting their weight behind the record attempt is Chevrolet with the brand new limited edition UTESURF light commercial vehicle courtesy of PE Chevrolet. Aimed at the outdoor lover and adventurous, the UTESURF has a tubular stainless steel sport bar and a roof rack/spoiler combination which makes it simpler and safer to carry lifestyle accessories. 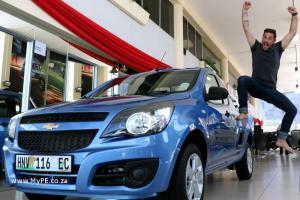 Tim Hendon, Chevrolet brand manager, said Chevrolet UTESURF is suitable for the surfing enthusiast and is the ideal vehicle to support Enslin’s endeavours to make a difference in the lives of underprivileged children. “We wish Enslin success in his record attempt and we invite the public to support his charity drive,” said Hendon. Enslin has been surfing since the age of 8. He describes surfing as being a huge part of his everyday life. “I have been practising very hard over the last two months. My training include water training, going to the gym and Brazilian jiu-jitsu. The most important thing right now is to get mentally strong. “I have the support of my family, friends and amazing sponsors such as Chevrolet behind me. Just thinking about the difference it can make in the lives of others is enough motivation,” said Enslin. The record attempt will take place at Pollock Beach on 14 and 15 November. The attempt involves Enslin catching a wave about every five minutes.